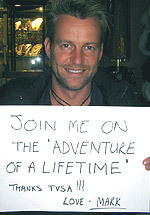 Mark Bayly is a South African television presenter best known for presenting the M-Net reality competition series Survivor South Africa, from 2006-2007. He was replaced as host by Nico Panagio from the third season onwards. He was also the host of the M-Net magazine show All Access, from 2009-2011. Mark was born in Mowbray, Cape Town, on 20 November 1970. He was Head Boy of Cape Town High School, where he was a member of the swim team and waterpolo team, but he also took part in school plays and received honours for Pro-Arts. Outside of class and off-stage, young Mark could be found on the beach, which he still today regards as his “sanctuary”. Instead Mark graduated with a BA degree, majoring in English, and he started his career working in several restaurants and managing a hotel in Bantry Bay. When the travelling bug bit he took seven months off to see the world. He also took part in the demanding Cape To Rio yacht race with a friend. For four years Mark turned his love for Cape Town into a career, when he and a friend started a business showcasing the beauty of the Cape to overseas visitors. Eventually he was headhunted by his current employers, an Internet outsourcing company, where he looks after international VIP clients. Mark had been with this company for two-and-a-half-years when he heard that M-Net was producing a South African series of Survivor and auditioned to be on the show. He was offered the role of presenter instead. 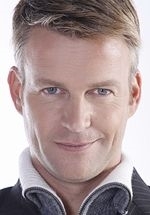 After a second audition in Johannesburg he was announced as the host of Survivor South Africa: Panama on Sunday 16 July. He is also recognisable to South African viewers from two television commercials - the first was a Microsoft ad, in which a busy father picks up the wrong kid, and the other was an ad for SA Home loans, in which a family are enjoying a picnic next to the pool. When the real home owners return, the picnic squatters have to bail over the wall. He lives in Seapoint, Cape Town, and is married to Gabi Christy, a past Springbok synchronized swimming champion who owns her own PR Agency. The couple have two children: a son, Cooper (born 2008) and a daughter, born in 2011. Bayly is the son of Peter Bayly who owns Peter Bayly Wines in Groenfontein, Calitzdorp, on the famed Cape Wine Route. His star sign is Scorpio and he drives a 1982 Golf convertible. He loves the beach, surf skiing and his father's port farm, "where Port is made in the traditional Portuguese way."